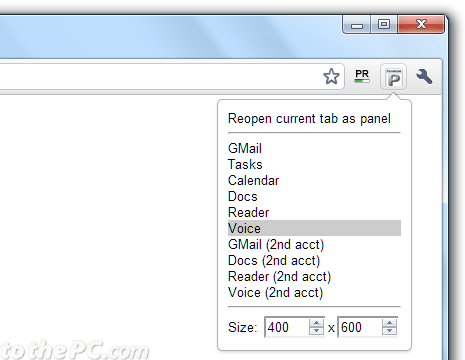 Tabs makes browsing very easy and quick. 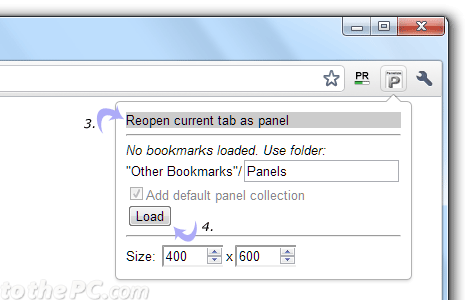 You can comfort the browsing level further by using panels in Google Chrome browser. Panels interface is very useful for comparing web content (webpages). You can also perform multi-tasking easily: like watching Youtube video while keeping eye on Google Reader updates at the same time. You an easily open any Chrome tab as panel using free ‘panelize’ Chrome extension. 1. Open Panelize extension webpage in Google Chrome browser. 2. Click install button for the installation. After install, you should see panelize icon at top right part of menu bar. 3. While specific tab is opened, click panelize icon and then click ‘reopen current tab as panel’ option. Current tab content should open in the form of panel (a sort of resized browser window). Similarly, you can open multiple tabs in the form of panels as per requirement. You can also customize the size of panels by changing values size of width and height of the panel. 4. 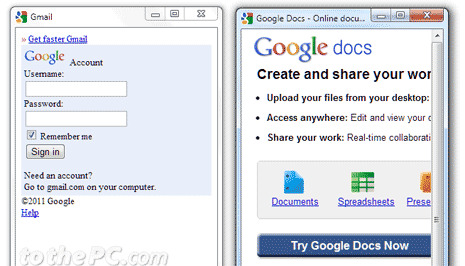 You can also open popular Google services as panels directly. Click on panelize button and then click load button to view shortcuts links for Gmail, tasks, calendar, docs, reader, voice and more. Panels for sure makes data comparing and multi tasking easy within Chrome browser. However, there is a downside as few website might break when viewed in panel interface. This is more suited for mobile web browsing though!